The ancient Egyptians are known for their beautiful temples, and the Luxor Temple in Thebes is one of the most extraordinary. Dating back to 1392 BCE, the temple was built on the east bank of the Nile River and is dedicated to the deities Mut, Khonsu, and Amun. Its construction was begun by Pharaoh Amenhotep III and was completed by Pharaoh Tutankhamun. Containing ten sections, Luxor Temple is massive. The entrance alone is over two hundred feet (sixty-one meters) wide! It includes: the Avenue of the Sphinxes, First Pylon, Roman Camp, Mosque, Court of Ramses II, Court of Amenhotep III, Chapel of Mut, Chapel of Khonsu, Chapel of Amun, and finally the Birth Chamber. The temple walls were made of mud bricks in order to symbolize the separation between the world of the Egyptians and their deities. One of the main functions of the temple focused on the annual Opet festival, an event in which statues of Mut, Khonsu, and Amun would travel from Karnak to the temple. 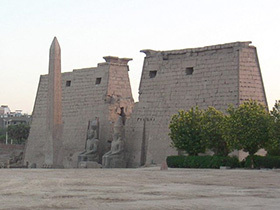 Unlike many other ancient constructions in Thebes, Luxor Temple still stands and is visited to this day. It is also still used as a place of worship. The philosopher, mathematician, and Egyptologist R.A. Schwaller de Lubicz (1887-1961) wrote The Temple of Man, following a twelve-year study of the temple of Amun-Mut-Khonsu at Luxor. Through a reading of the temple’s measurements and proportions, its axes and orientations, and the symbolism and placement of its bas-reliefs, along with his accompanying studies of related medical and mathematical papyri, Schwaller de Lubicz described how advanced the ancient Egyptian civilization was and that it possessed exalted knowledge and achievements both materially and spiritually. His study concluded that the temple is an expression and summary – an architectural encyclopedia – of what the ancient Egyptians knew of humanity and the universe. https://www.airpano.ru/files/Luxor-Egypt/2-2 - 360° Images of Luxor Temple. Schwaller de Lubicz, R.A.. The Temple of Man: Sacred Architecture and The Perfect Man. Inner Traditions, Rochester, VT, 1998.